Directions: The closest town is Bend, OR. Take the Cascade Lakes National Scenic Byway to the west for about 40 minutes. The left turn into Sparks lake is a bit nondescript but visible if you pay close attention. Drive another 5 minutes in, taking the first left turn towards the jetty. Sparks Lake is beyond beautiful. It is perhaps one of the calmest and most majestically beautiful places I have been to. It’s a feeling quite difficult to explain until you experience it. The main view is quite close to the jetty and you can get to it by following the trail to the left and staying close to the water’s edge. The weather though, is notoriously temperamental. It can be sunny and beautiful in the town of Bend with beautiful weather predicted for the rest of the day. But then, you can drive out and within 15 minutes of arriving at Sparks Lake, the weather can change drastically for the worse. Being on a higher elevation, the clouds can drop into this valley and rain is frequent. I visited this location thrice and on the first two visits, it was rainy and gloomy and you could not see the Two Sisters , the mountains in the backdrop. The third visit brought me perhaps the most beautiful dawn I have ever witnessed. It is quite spectacular considering the fact there were no clouds in the sky and the early light had no foil to spread the morning colours. But the low mist rolling across the lake as the morning dawned made it quite magical. This lake is a popular fishing, kayaking and hiking spot. So it does have a lot of visitors in the summer months. The roads leading to the lake can get treacherous in the winters though so be careful if you try getting there then. 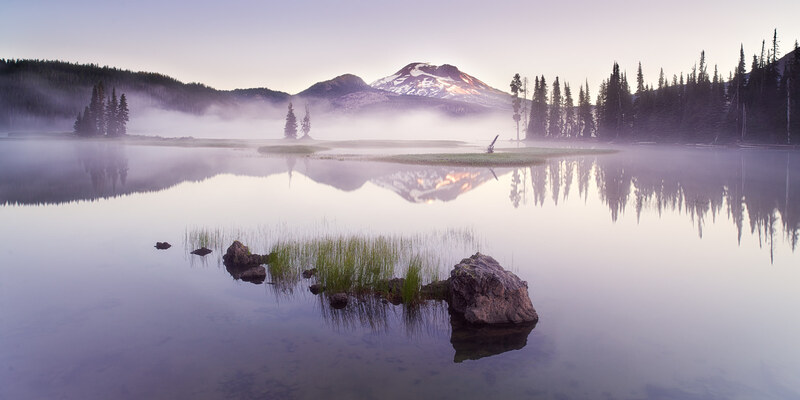 Sunrise is in my opinion the best time to photograph Sparks lake. I don’t know of too many places that have such a calm vibe and rolling mists. It is possible to camp out there with proper permission (or so I have read). This may be a good way to be in location for the right moment. Rain gear and waterproof boots are good to have. It can pour (or spray) often. It might even be worthwhile finding a spot to step into the lake and photograph from there.